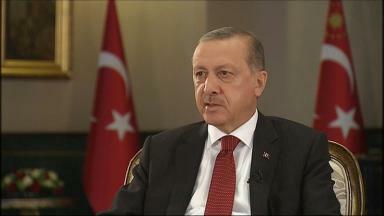 Turkish president said another coup attempt would not be easy, as authorities are now more vigilant. Turkey's president Recep Tayyip Erdogan has said another coup attempt is possible, but maintained it would not be easy as authorities are now "more vigilant". Mr Erdogan said a new structure in the armed forces would be put in place in a short time, and that the military must have learned serious lessons from the coup attempt. "We cannot afford to be complacent," he said in an interview with Reuters. The president said a network loyal to cleric Fethullah Gulen will be treated as another separatist terrorist organisation after the failed coup. Turkish authorities have blamed Gulen, a one-time Erdogan ally, of being behind the attempt to topple Turkey's government and called on the US to arrest and extradite him. Mr Erdogan vowed to exact revenge on the coup plotters, and on Tuesday, Turkey's Justice Ministry sent the US a dossier amid the calls to extradite Gulen. Prime Minister Binali Yildirim pledged to supply US authorities with evidence linking the coup attempt to Gulen, who has been exiled in Pennsylvania since the late 1990s. A spokesman for the Turkish government said the US should be able to extradite the cleric "on grounds of suspicion" rather than requiring specific facts about the case against him. More than 50,000 people have now been rounded up, suspended or dismissed by the Turkish government as part of its purge of alleged opponents following last week's failed putsch. Mr Erdogan said 246 people other than the coup plotters were killed in the abortive attempt to overthrow the government, with 2,185 injured.